Your Session/Token Has Been Expired Pls Click Below Refresh Button To Continue. Click on the training headlines below for more information and to register. All training webinars are for Listings-to-Leads' clients as well as any and all agents, brokers, admins, virtual assistants and others. These are training webinars, not sales webinars, and you will learn a lot, whether you are a client of ours or not. Start your marketing off strong with a series of tools designed to promote your listing to increase exposure, and generate referrals and leads! The RIGHT way to do Facebook for your listings! Proven 5+ piece auto marketing campaigns that generate referrals and leads from your seller's SOI via their Facebook wall with pre-written calls-to-action and links that drive traffic to increase your business! Automated Interactive Voice Response and Shot Code Texting! Designed to capture leads and connect them to you as fast as possible! Leads can request virtual tour to be sent to their smartphone, direct connect to you to ask questions / schedule a showing or listen to an audio recording of the property description. The Single Property Website shows off your listing, generates leads and drives traffic back to your website from from Just Listed through Just Sold. Single Property Website branded to you with dozens of colors to choose from changes as your listing's change and are video ready! The RIGHT way to do email marketing for your listings! Proven 5+ piece auto email campaigns that generate referrals and leads from your seller's SOI via email marketing with pre-written calls-to-action and links that drive traffic to increase your business! Text 10001 to try for yourself! IVR & Text Pricing: monthly recurring depending on subscription + $ per IVR lead / $ per text lead. Virtual Tours that generate leads while showing off your listings beautifully on all devices. Add property videos in seconds for a truly virtual tour! Branded and unbranded virtual tours for your MLS, Realtor.com, Zillow, Trulia and more! Print flyers with a few clicks in seconds! Designed to showcase your listing AND drive consumers from offline to online! With over three dozen print flyer versions to choose from, you can print your flyer with a few clicks in seconds, or send them out to be professionally printed! Auto integration with optional Interactive Voice Response / Text messaging for more information! Craigslist made fast & easy! Auto generated listing videos uploaded to your YouTube channel and our SearchALLProperties YouTube channel driving SEO and traffic to you! Twice the SEO, branding and lead generation opportunities with listing videos uploaded to your YouTube channel and ours! Automatically includes link to your branded virtual tour on both your channel and the SearchALLProperties YouTube channel! Includes all your branding and contact information in all listing videos! Pre-formatted and branded blog posts available for ActiveRain, WordPress and more! Every account gets a free WordPress listing blog that we auto post your listings to! Pre-formatted blog posts for your listings for more SEO, traffic and leads! mobile responsive Listing Landing Pages! Clients are generating dozens of leads a day, 100+ a week using Listing Landing Pages on Facebook! Listing Landing Pages for: Coming Soon, Just Listed, Active, Pending & Just Sold! "I have been inundated with a tsunami of leads!" 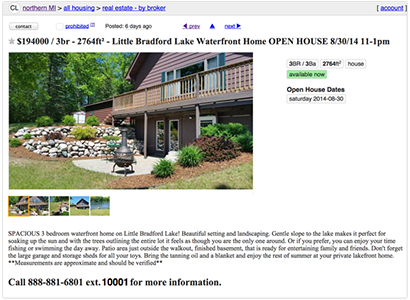 "I have generated 24 leads in the first 48 hours with 2 listings!" The most powerful Open House Marketing system in the industry that generates leads and referrals before, during AND after your open house! Property Valuation landing pages on your tablet or laptop! generate buyer leads for their home! 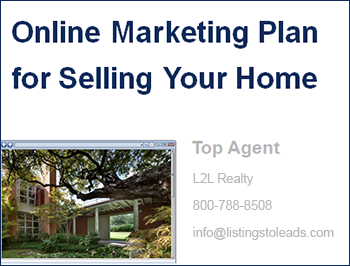 Seller's do not just want to know your marketing plan for their home. They REALLY want to know how you are going to generate buyer leads for their home and get it sold! When Listing-to-Leads' clients show sellers their Marketing and Buyer lead generation plan, they win almost 100% of the listing appointment they go on. It is really almost that simple. Generate referrals, buyer & seller leads with the Just Sold marketing tools! If your MLS or company uses ListHub, we have your listings ready for you and are updating them nightly! Copyright © 2019 beta.listingstoleads.com. All Rights Reserved.